Hello! This time I am writing from my bed in Shinjuku-Ku, Tokyo! After I had a hard time preparing everything back in Germany, I finally made it to my new home. 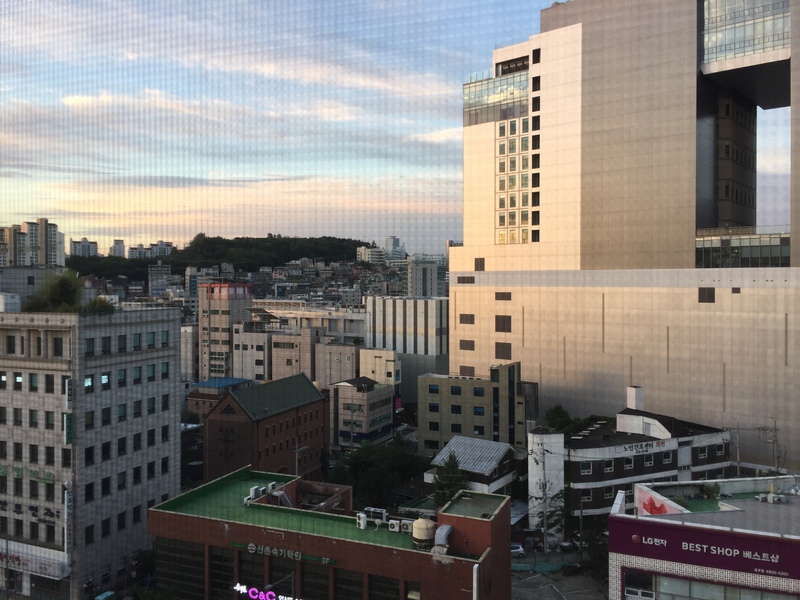 Since I missed the opportunity to write a blog about my year abroad in Seoul, I felt like this time I have to write about my experience in the most exciting country in the world, Japan. Next question was, wether to write this all in German or in English, because my English skills are not the best, as you may see. But I have many friends all over the globe, so I decided to write in a language everyone can understand, I mean, hopefully. But back to the main story. The preparations for my study in Japan began with applying for my prefered University in Japan at my home university. I could chose 3 universities ranked from first to third choice. My top 3 have been Rikkyō, Sophia and Waseda University. After my teachers decided to send me to my first choice, Waseda University, I was waiting and waiting for a mail with a note of confirmation. In March finally, I got a mail from my instructor at my home university, that Waseda accepted me as an exchange student for the Language Program. Only after I got this confirmation I could really believe I am going to Japan this year. I was so excited. And I was ready to book my flight. A long time of waiting for results of the dorm application and a hard time studying followed. In July I received the dorm notification. I got a room in one of the Hoshien Dorm Buildings. Back then I was relieved, but why I was disappointed when I arrived you will see a little later. Then, mid to end of a really hot July, the longest exam period ever (at least it felt like it) gave me sleepless nights. Insomnia and light depression made it the hardest time during my university life so far. But somehow I survived and could focus on my student job in my dads company right after coming out of the last exam. For an expensive country like japan you better work for a bit extra money. So I wanted to work as much as possible. The next step was the application for the Visa. 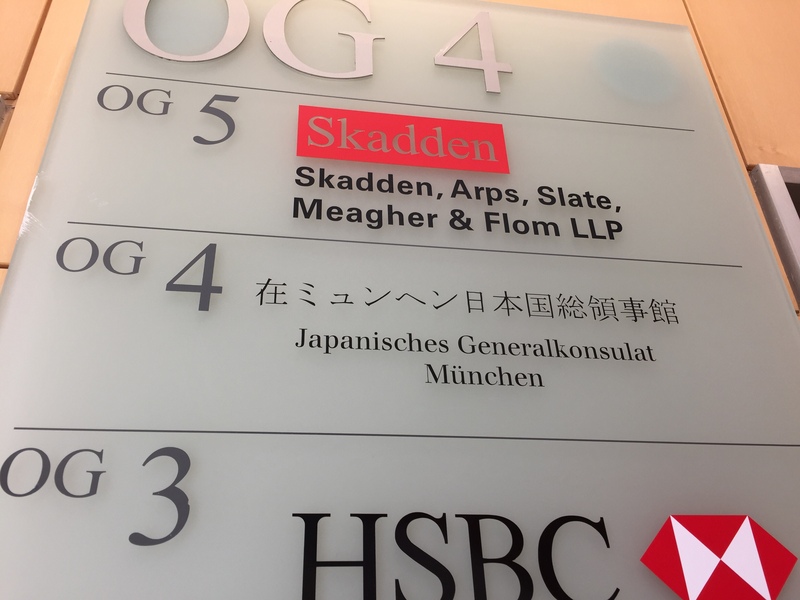 My documents, including the Certificate of Admission, came around the end of July and I had to visit the Japanese Embassy in Munich. Munich is quite far away from my hometown and the train tickets were very expensive. However, the process of the visa application is completed very quickly and after 5 business days you can already collect your passport with the visa sticker in it! 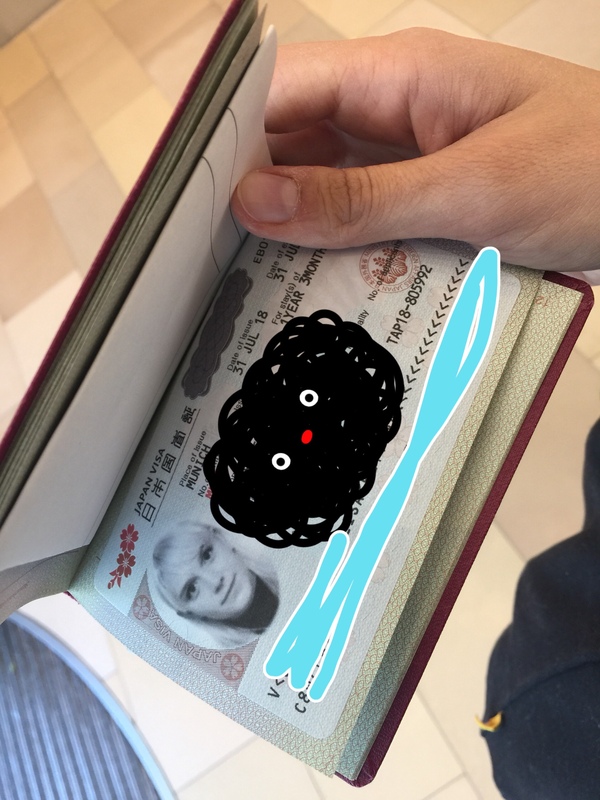 On the other hand you have to get your passport personally. They will not send it to you. I was already working when I got my exam results from my home university. Fortunately I passed all. But working and preparing for Japan was really stressful. 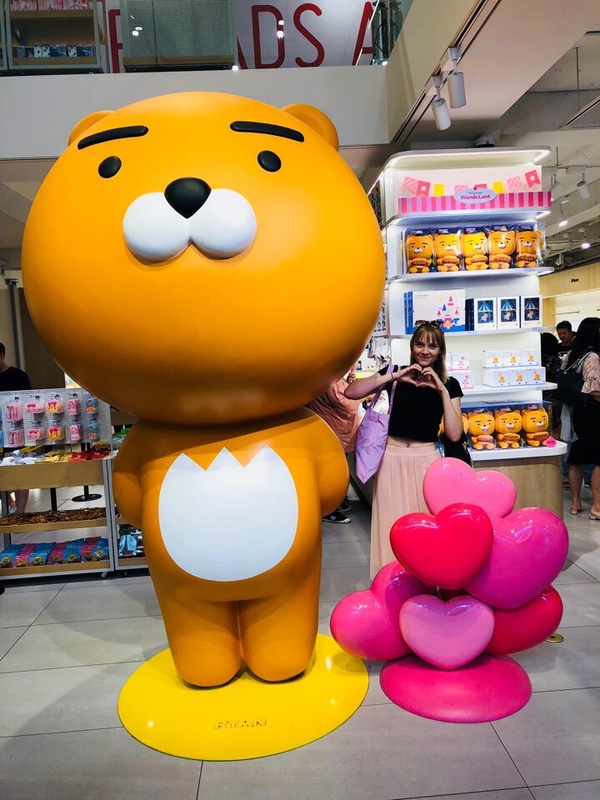 Running to every doctor, buying things you may not get in Japan and have them in stock, I gained a lot of weight and felt exhausted even though I didn’t do any physical exercise. The hard training losing all weight was wasted in just a month. But it was too late anyway. I was working until 31st of August and I left at the 5th of September. Let me tell you, 5 days are not enough for final preparations! 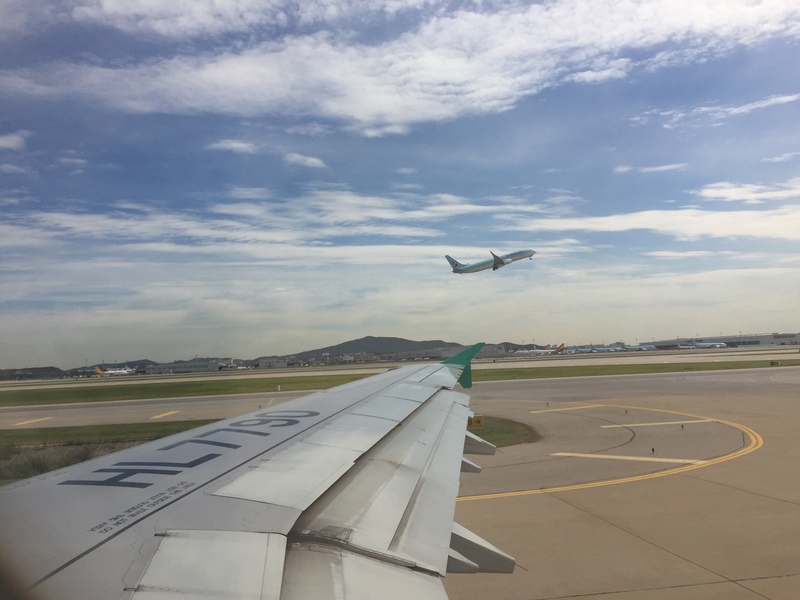 The worst thing that happened was that I already missed my flight when I was waiting for the security check at the airport. I think I had never run so fast in my whole life. And the best was, the flight was delayed. ha! 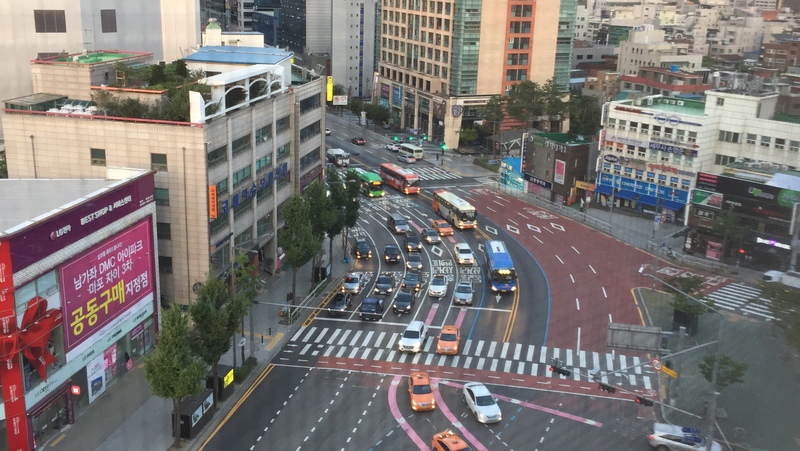 My first stop was in Seoul, South Korea. 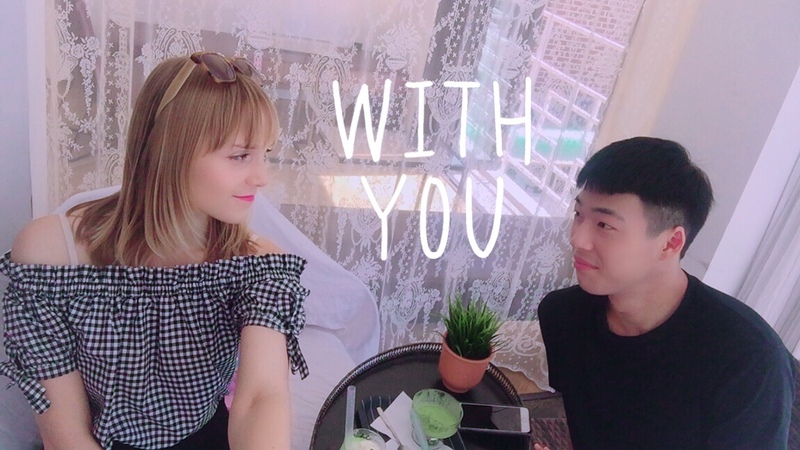 I spend a good time visiting my friends who study there and had a good time with my boyfriend, too. 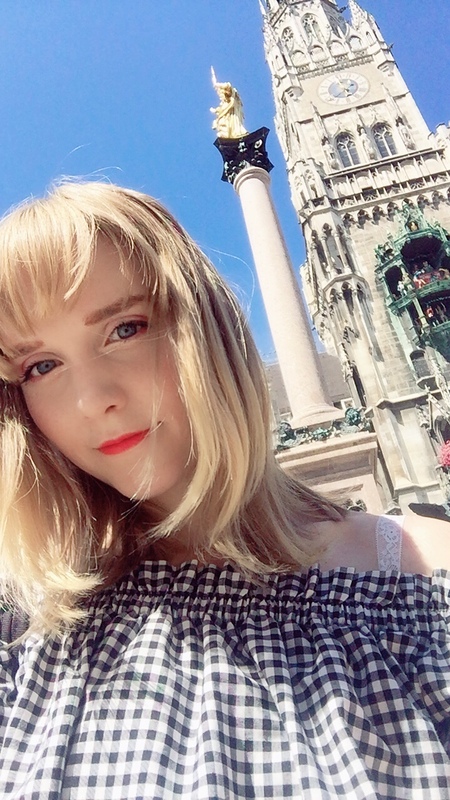 The sad thing was, I was super jetlagged until I arrived in Japan and I wasn’t feeling the best. But thanks to my considerate friends and boyfriend I could relieve my stress a bit. Love you!! 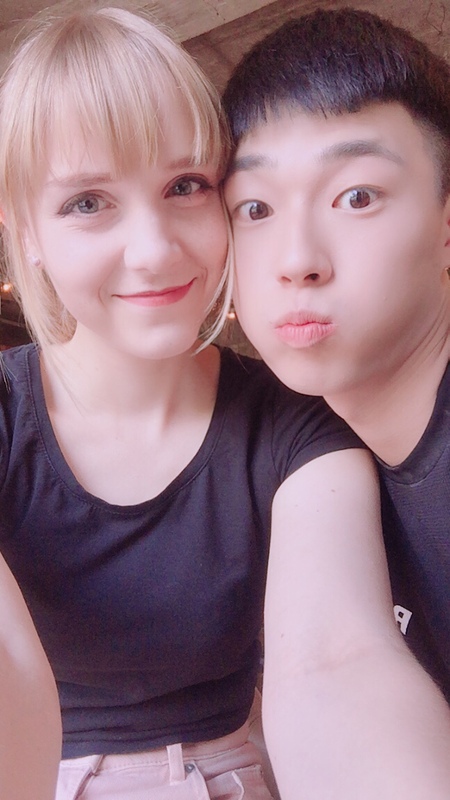 안녕 서울! The next step was to get on the plane for Japan. This flight was one of the worst I ever been on! 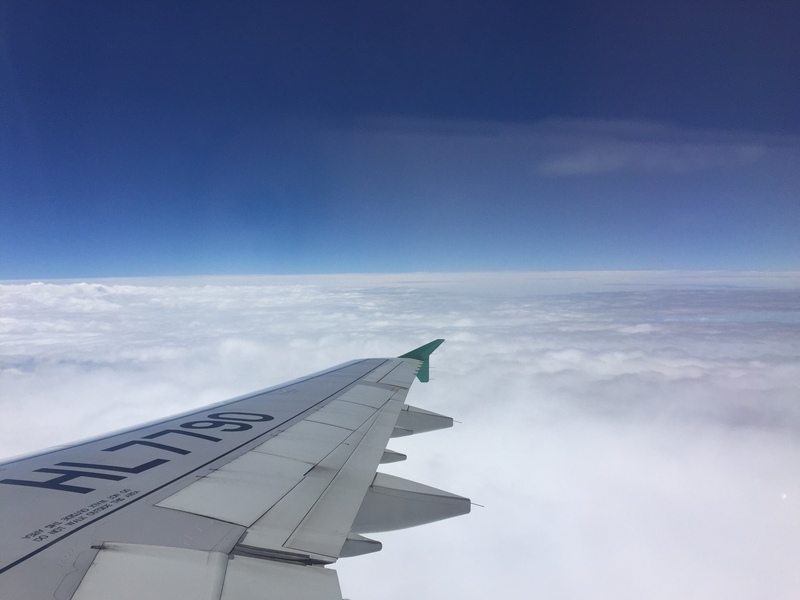 I took Air Seoul, which is a cheap sub airline of Asiana. The crew was friendly and the food was good, but my stomach and my neighbors gave me a hard time. 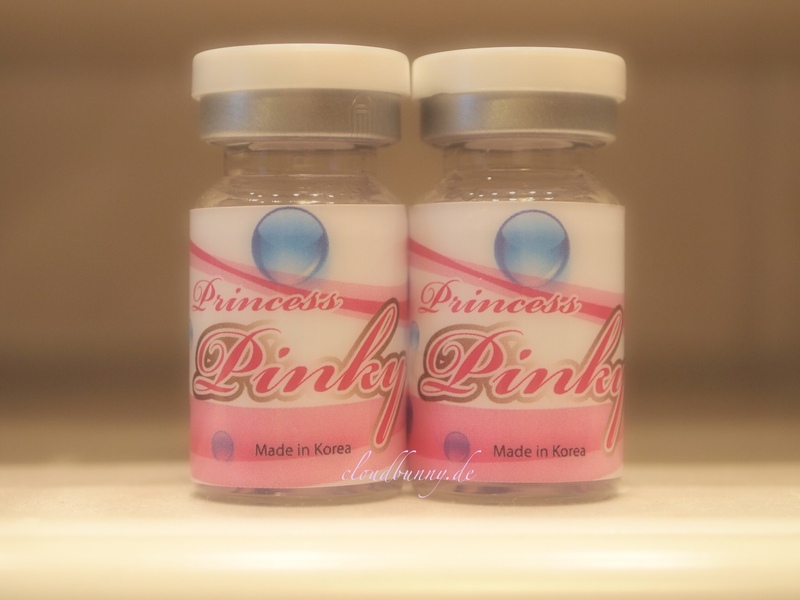 I was curious how the Princess Pinky Galaxy Circle Lenses look like so I ordered them right away! It was difficult to chose between the two available colors so I just ordered both of them! I got them at Pinkyparadise.com since this is the only website I have experience with and know to sell them. They were around 20€ each (depending on exchange rate) and they arrived really quick without any circumstances. Inclusive in every lens order is a lens case for each pair you order. The lenses come in a container that are a bit tricky to open. Once opened you can see the clear Galaxy print in blue and violet, with small white strains that look like stars inside the gas clouds. Really beautiful! These lenses are definitely not made for wearing to school with light day makeup, except you want to be sure to get the attention of your classmates. Especially the blue ones are really bold and bright blue and look really like out of this world on light eyes. The violet ones are slightly more unflashy but still drawing attention. 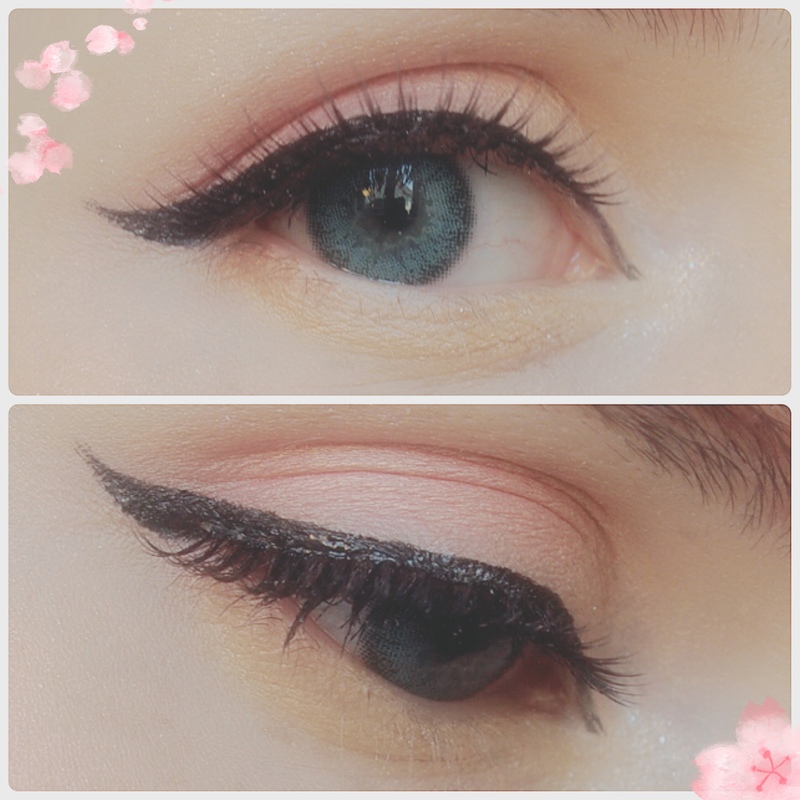 Typical circle lenses with the black circle on the outside. They have an enlarging effect with a diameter of 14,5mm. They felt quite soft when I put them in, but I didn’t wear them for more than one hour yet, because I didn’t have the occasion to wear them out. Going grocery shopping with these lenses in here would just make people stare. I would rather wear them at nighttime, because my light eyes are flashing under them if the sunlight makes my Iris to shrink naturally and this looks very weird. How can I say it.. they don’t look natural at all of course, that’s not the purpose. I think people with brown eyes would look even better with the blue ones, because the darker color makes the blue look less flashy and maybe make the stars pattern looking even brighter. The first picture I took without flash and wearing only one lens. In the second picture I am wearing both and to show the pattern and I used the camera’s flash. I don’t regret that I bought them, but unfortunately I barely have an occasion to wear them. 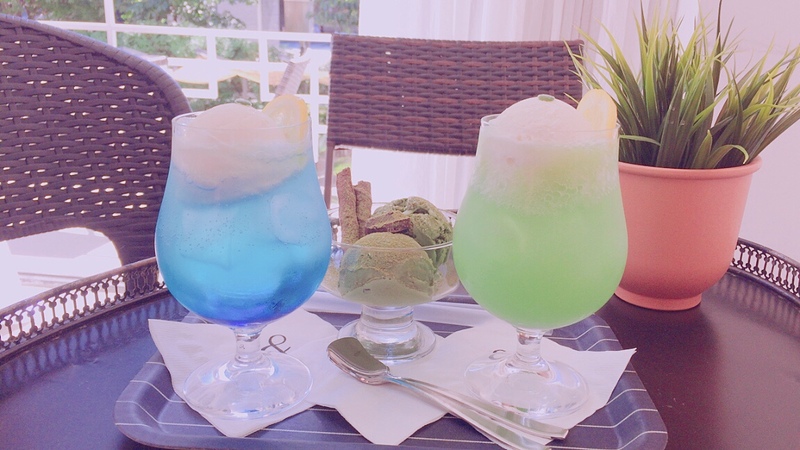 I bought both colors, which was of course a bit expenisve, but you will be fine if you only one pair of them. I think these lenses will be catching everyone’s attention if you wear them on a party or a night out! Stunning! If you are looking for some natural looking lenses, I would like to show you my last post about the EOS Milky Blue. Thank you for visiting my website and hope you got the I formation about these lenses you needed to decide wether to purchase them or not. Hope to see you again! 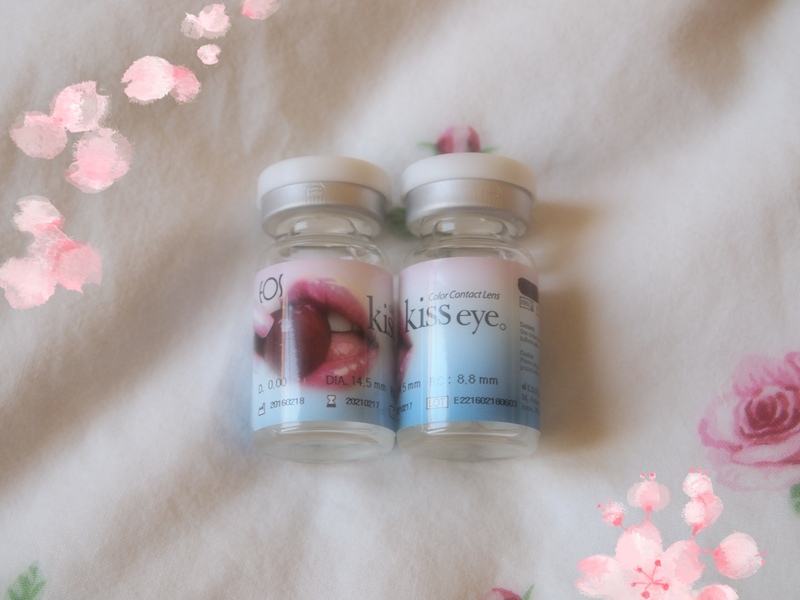 Today I want to share my thought on the lenses I bought last week: the EOS Milky Blue! 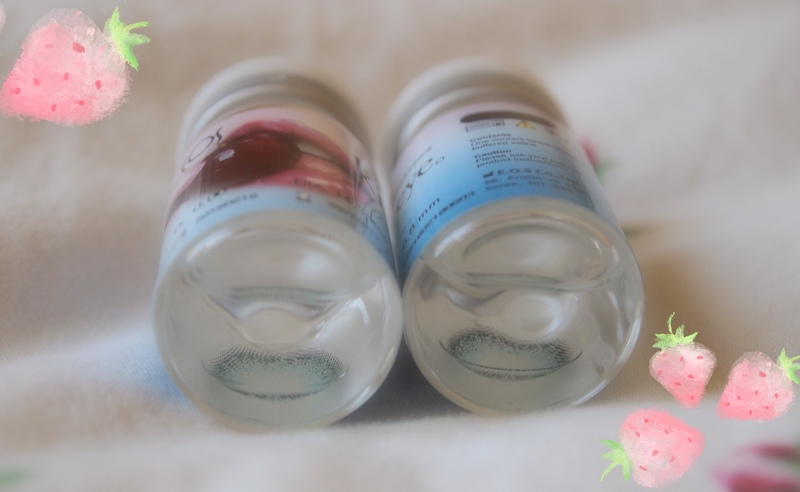 I ordered them from an online shop based in germany called Matlens (matlens.de). They are my only EOS ones I have atm and I wanted to go for a pair I can wear daily and with natural makeup. The shipping was very fast, I got them two days after I ordered them. As the name says, the EOS Milky Blue are designed to look a bit milky, I would describe it like a bad quality print with visible pixels. They have a light outer circle and the color isn’t too bold, more like my natural eyecolor a light blue. They come in the usual packaging, a small glass container and the danger to cut yourself haha. I’m safe though. 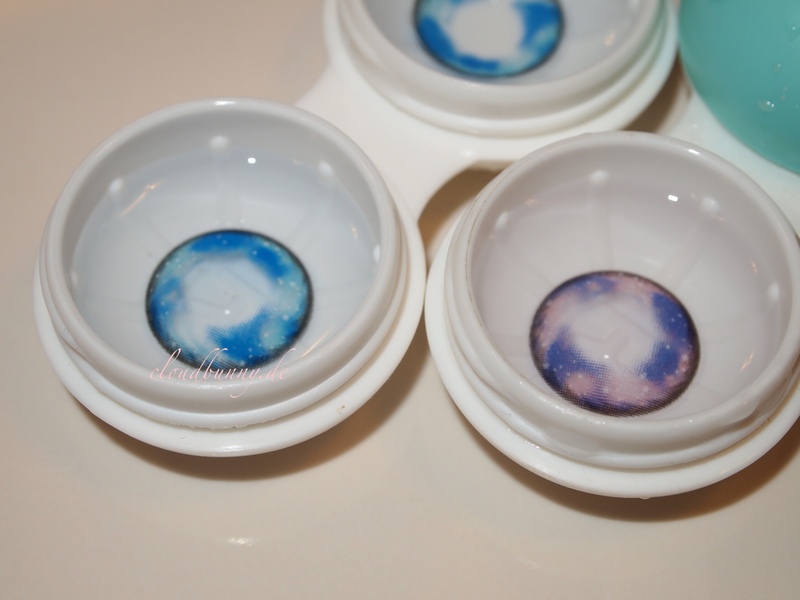 I washed them with lens solution and put them in one of my lens containers. The shop provides a small lens case and solution with each pair, which is a really good service in my opinion. The Eos Milky Blue are ones that have an actual diameter of more than 14mm but the print on them is much smaller. So they don’t have that enlarging effect and look very natural. And this time I mean really natural because they melt with my natural eyecolor perfectly. The „pixel print“ that I was talking about before makes the circle looking soft and overall blurry. In my opinion these lenses would suit a cute and romantic look. After 4 hours of wearing them they started to feel a bit dry but they don’t stick on my finger when I touch them like the GEO ones do. I didn’t wear lenses for a long time so this impression might change after a few times of wearing them. 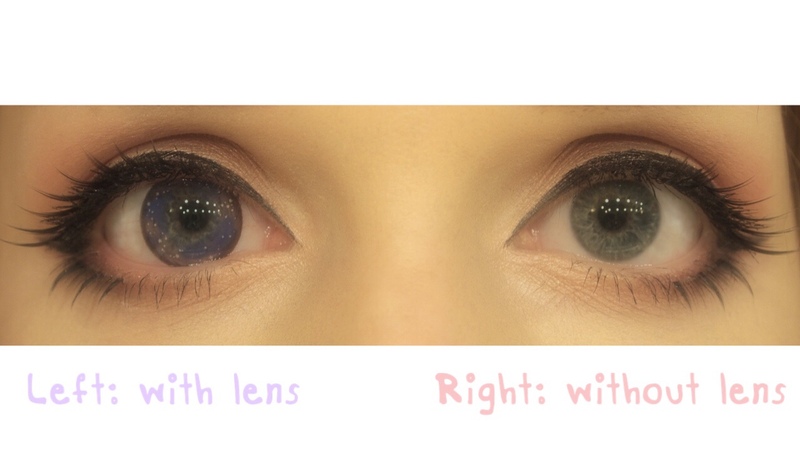 I would say for yearly and colored lenses they are on the more comfortable side of circle lenses. The Price – not too expensive for yearly lenses. There’s nothing negative for now. Since I wanted natural looking ones, the lack of enlarging effect isn’t really a bad thing here. Of course the last point refers to my eyes only. If you have brown or ash grey eyes, the color might look different and not as natural as they do on my eyes. I look forward to wear them to university sometimes with my daily natural makeup. 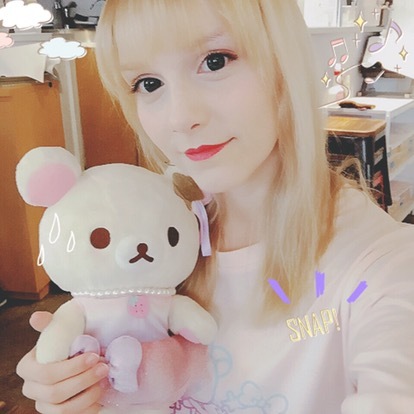 If you want to create a big eyes look, I would recommend to go for another pair of circle lenses. 10 reasons to start exercising now! Today I want to give you 10 reasons to start exercising right now and keep going throughout 2018! Many of you know I have been struggling with my weight and started exercising, wether it was running or doing a complete workout at the gym. I am not a model nor am I body builder, but I am close to my personal goals and keep improving every time. The main goal for me was to lose weight, but I found other advantages of exercising, too. Yes, after you workout you may look like a model. If you have been one before probably. No, the hard reality is that you need to exercise a long time to see first results on your scale. First you gain weight and many give up at this point already, but you actually already exchanged fat for muscles! If you start exercising regularly and go on a more healthy diet, you’ll lose weight. Feeling bloated? Last minute exercise is mostly the key to avoid a round belly in your tight dress on new year’s. Exercising helps your body to digest faster and better and helps preventing a bloated tummy. It’s keeping your metabolism up throughout the day. You know the feeling of you could be eating all day? A sudden greed for a bag of chips or even a bowl of rice? I noticed myself whenever I completed a workout session I don’t feel like randomly snacking at all. Sometimes I could even let the day pass by without eating after a visit at the gym (which is of course not healthy!!) If I haven’t eaten all day I get hungry even during the workout, but I eat a normal portion and stop eating when I don’t feel hungry anymore. So who works out eats less. Totally exhausted after those stairs to the next classroom? I know. But with exercising regularly you will feel in a better condition overall. The reason for these ugly little holes in our problem areas is that there’s no tension, not enough hydrated, no muscles, fat. With exercising, reducing fat and building muscles you can naturally lift and strengthen those areas and you will see how it’s getting less after a short while. Of course exercising alone can’t do those miracles, for the best results a healthy diet is a must. Did you know that exercising can make your day a little brighter? If you experience success in exercising it motivates you to reach your goals in other parts of your life, too! Only logical, right? I always felt like I could do big after completing a good workout. 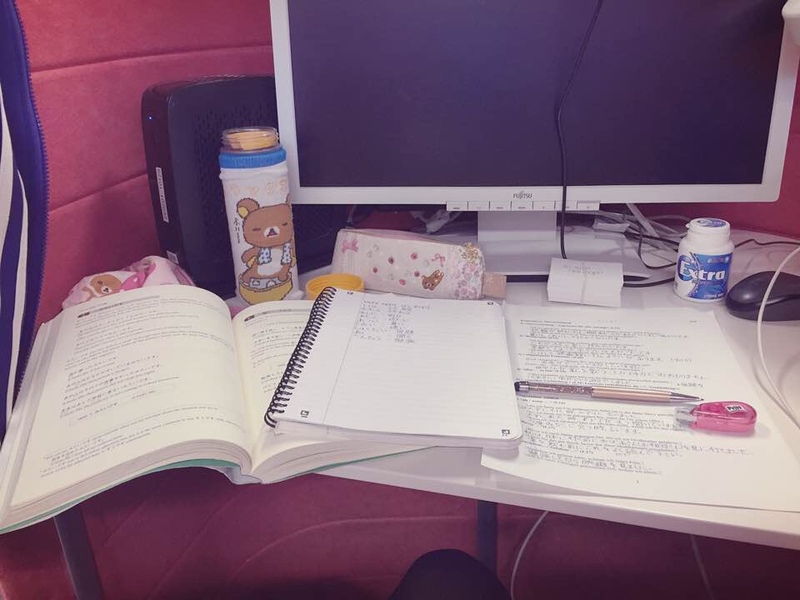 I study a lot more since I exercise and my grades went up, too! Exercising and getting physically stronger makes you feeling stronger in personality. New confidence, knowing you’re looking great makes you feeling great. I learned how to see the positive things even in bad situations and try to find a solution more effectively than I did when I wasn’t exercising. Not only cellulite will be improving, also your facial skin, arms, upper body, too! Exercising is turning up your blood circulation, especially in your facial area. Less acne (i don’t promise that though) and a healthier glow is a nice effect and another good reason to exercise. My dark circles look less deep when I exercise. I am not the youngest anymore but I feel like I am back in my teens again. When I wasn’t really active I felt like everything was hurting, I wasn’t flexible and agile that much anymore. With exercising I improved my flexibility and feel much more energetic than before. Yeah of course you heard that a lot and maybe even tried it before, exercising or working out can help releasing stress and find an inner balance. And by that I don’t say you need to do yoga or such things, I hate that myself, but to try exercising to learn about your body limits and strengths and to understand it. I never really saw my body as the thing that is carrying around my soul, my mind but with exercising I learnt to have control over my mind and body and for me exercising also became a way to release stress. I hope you found some motivation to start exercising this year. You don’t have to go to gym and do the hardest workout, also running or a dance class can be the exercise you need and enjoy. Even if you start at the bottom, you can and will improve. I couldn’t run 500m without collapsing and now I can run 10km and more on good days. Keep going and never give up. If you fall, get up and go on. I wish you all the best and keep working hard to achieve your goals in 2018! 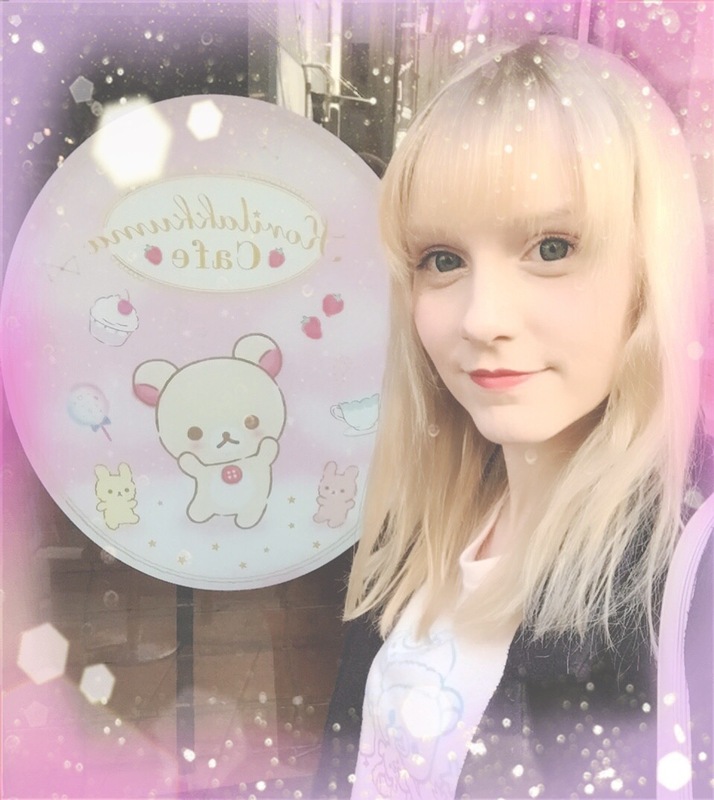 In January I visited Tokyo again for a special reason: the Korilakkuma Café in Harajuku! 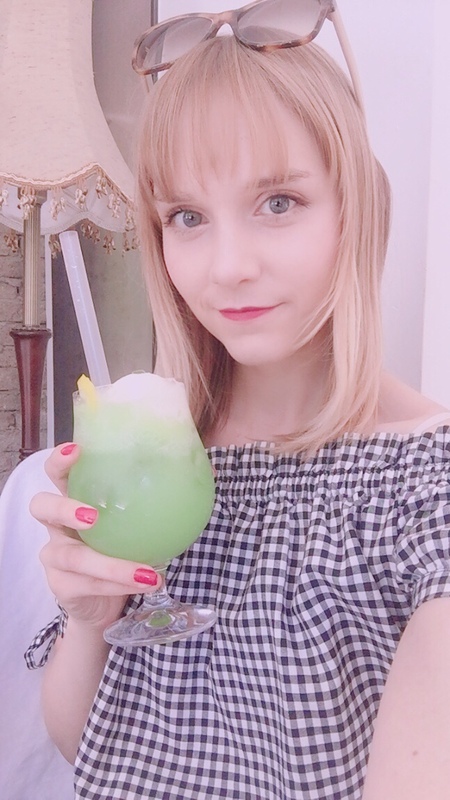 And of course for spending time with my bf, shopping, eating… but the main point was visiting the cute and fluffy restaurant that opened for a limited time next to Takeshita street! The difficult part was making the reservation that is needed to enter the café. The website is in Japanese and they had no intention on welcoming foreign visitors as they request a Japanese (somehow Korean worked as well but my German one didn’t) phone number and address in Japan. Also they asked for writing your name in Kana which is a little awkward if you don’t have a Japanese name and they try to call you. Somehow I made two reservation back in Dezember for the 31.01. and 01.02. The café will close at 15.02. and you need to reserve at least 3 days before your actual visit. Also I had to pay for only making the reservation, it was around 20€. When I was in Tokyo earlier I tried to enter without reservation hoping someone cancelled but they wouldn’t let you in even if it would be the case. 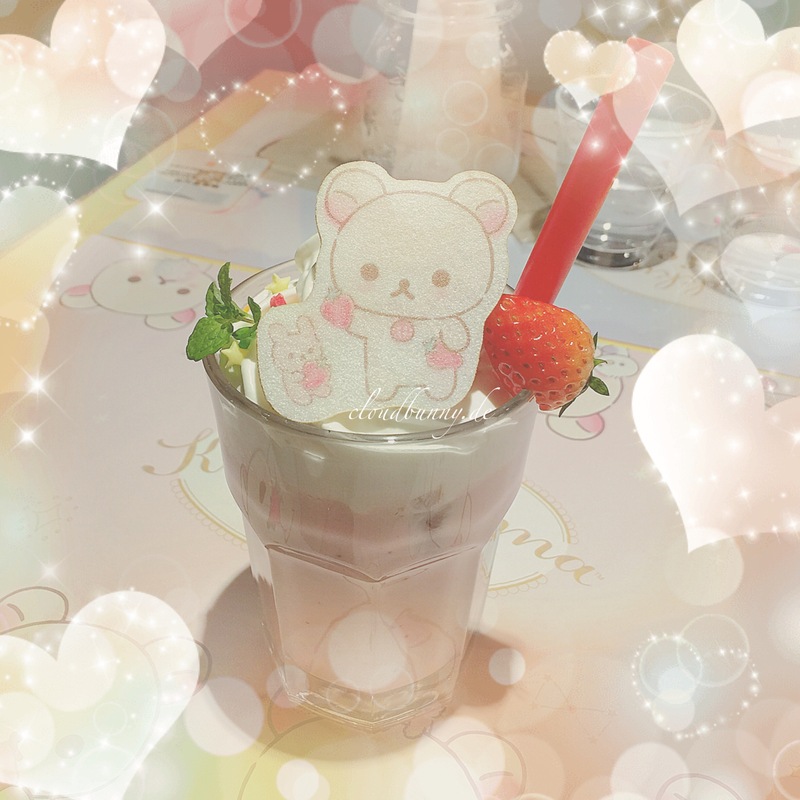 The café was decorated with pink and pastel color themed pictures of Korilakkuma. 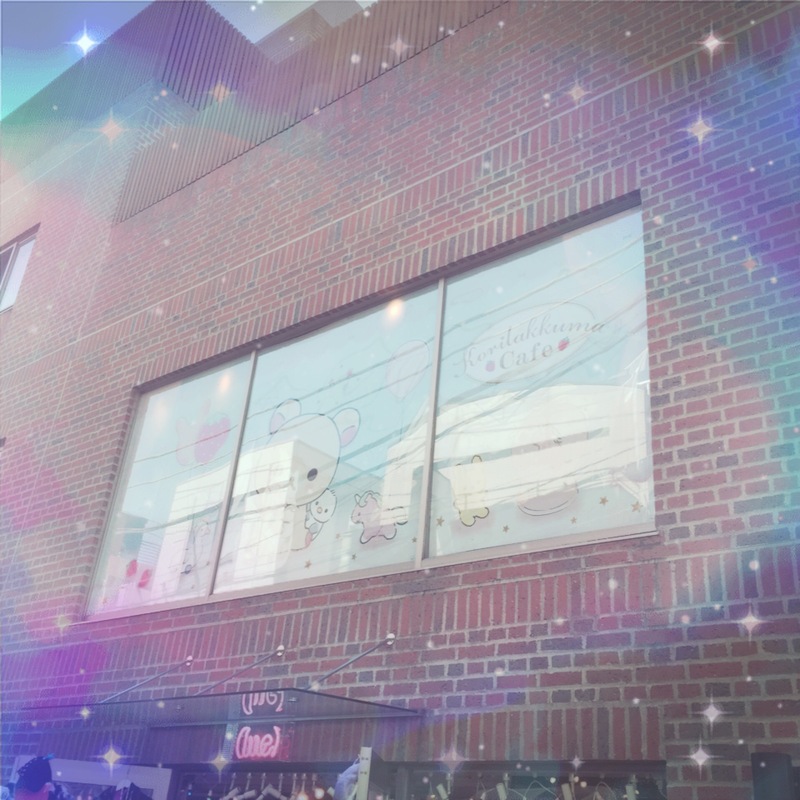 Everywhere were some Korilakkuma and Rilakkuma dolls and even the windows were decorated with Korilakkuma Stickers. 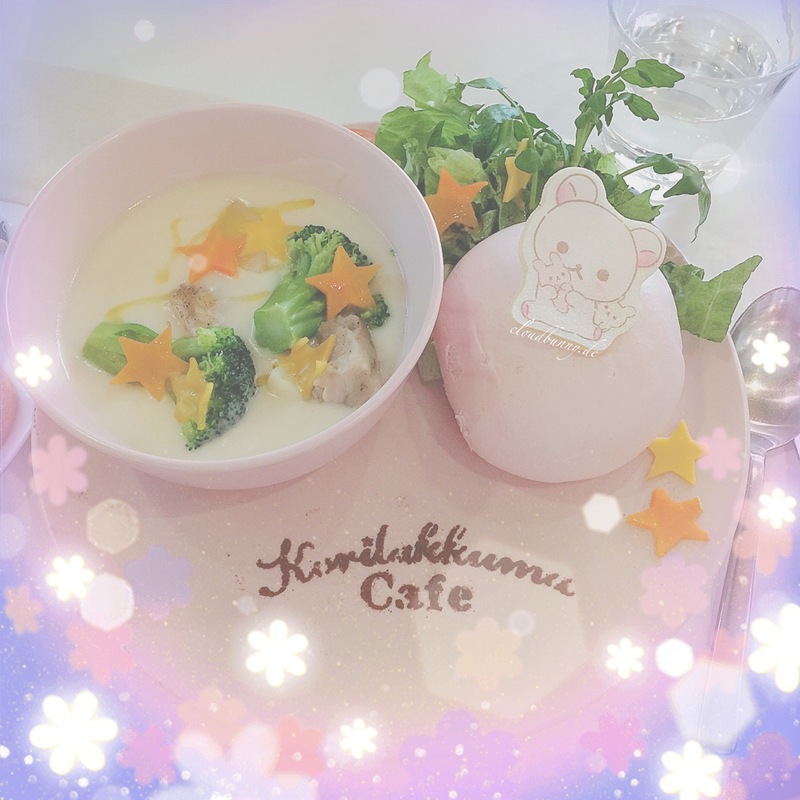 When you enter the cafe the staff hands out the towel that you get with every reservation and guides you to your seat with a postcard, a coaster and a paper dinner mat with Korilakkuma Café Logo on the table waiting for you. You might get sleepy after a while because they played songs in the background that sounded like coming out of a small music box. 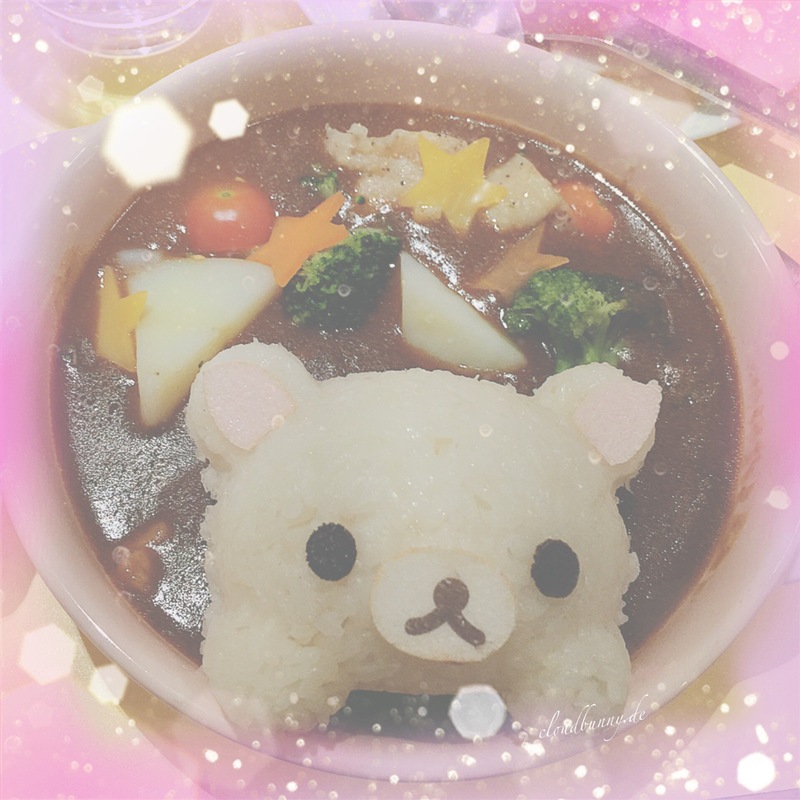 The whole atmosphere was just like the theme in the cafe: Sweet dream of Korilakkuma. 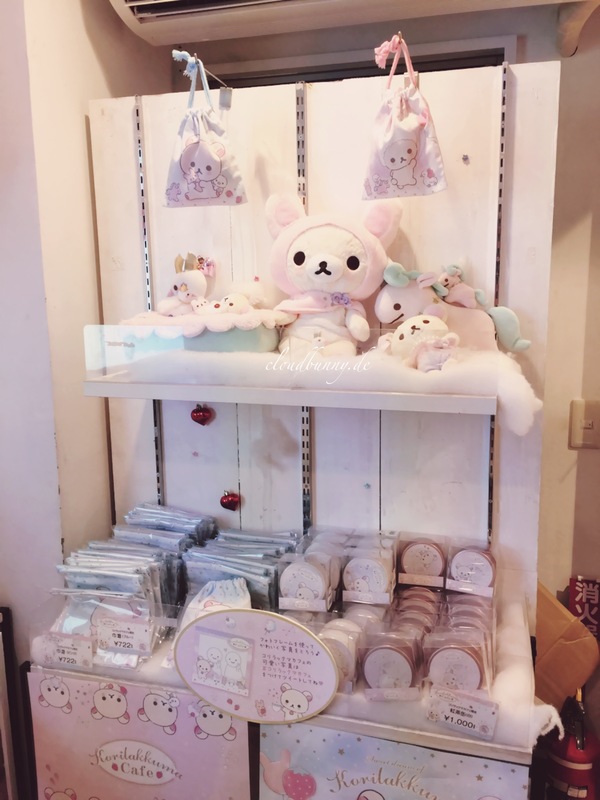 The staff was very friendly, even if they couldn’t speak English at all (and I mean at all, not even yes or no) but they tried to explain everything in Japanese since I could understand a little and speak enough to answer easy sentences. They served all the food with typical Japanese manner. 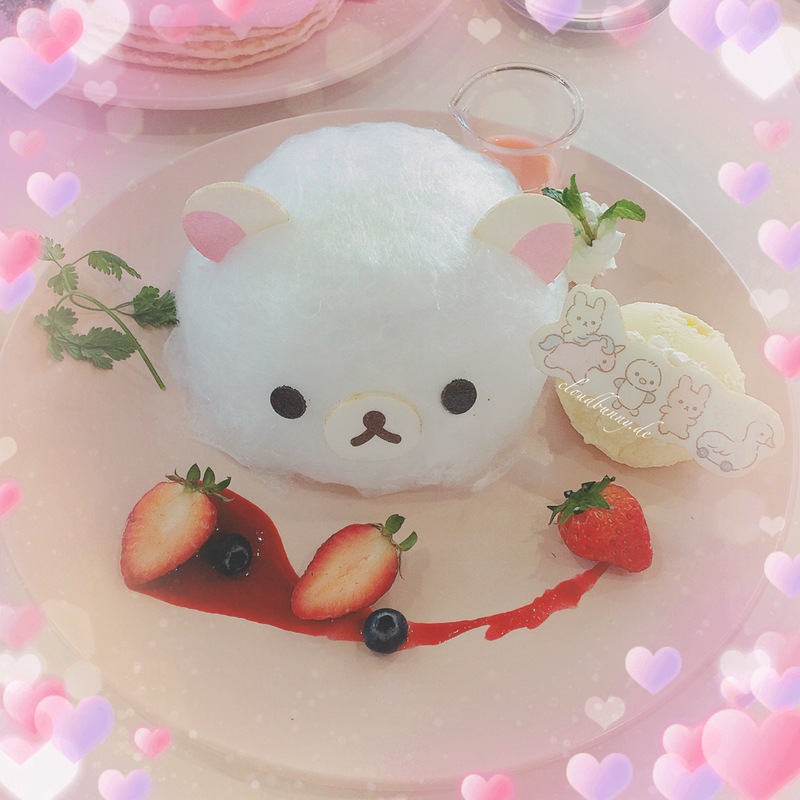 The menu included a few Japanese dishes, drinks and desserts, all with Korilakkuma faces and some even with fluffy candy cotton on top! You can look up the menu on their website. 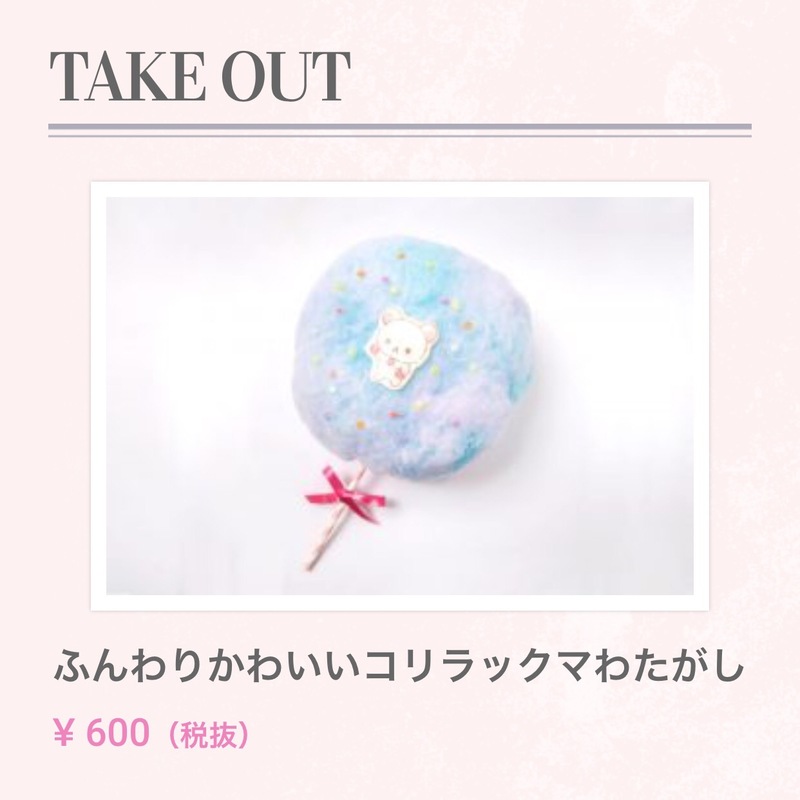 They even offer the cute candy cotton for take out! The first time we visited was around dinner time so we ordered the curry and the burger. Also I got the strawberry milk and my bf the fluffy strawberry soda. 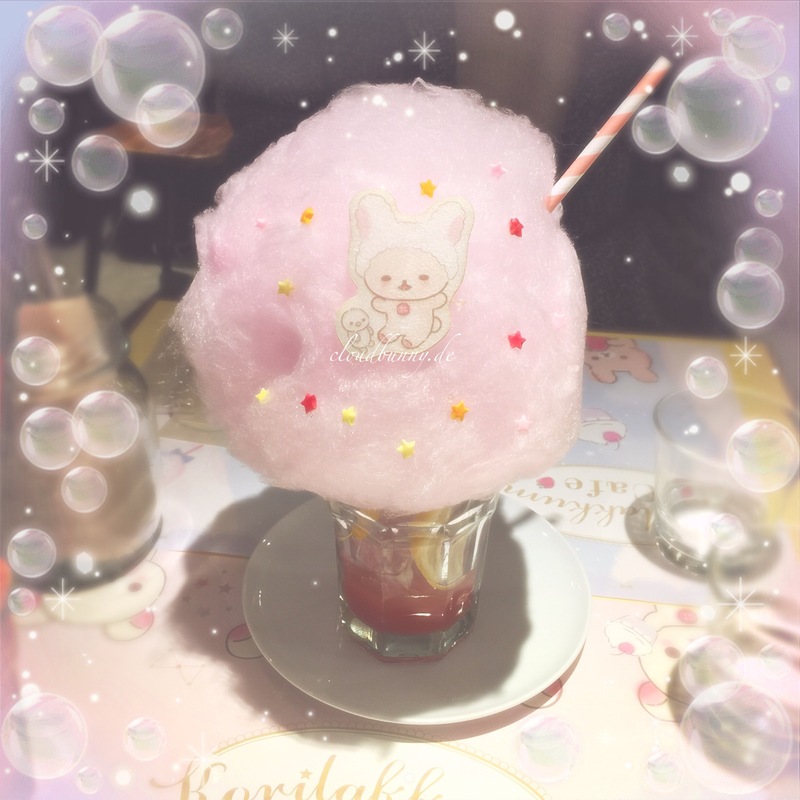 The next day we came around early lunch time and I had the creamy cheese soup and my bf got the curry again, I guess he saw how I was struggling with the burger bun the day before xD as a dessert I ordered the chocolate lava cake covered in cotton candy and my bf the berry pancakes. 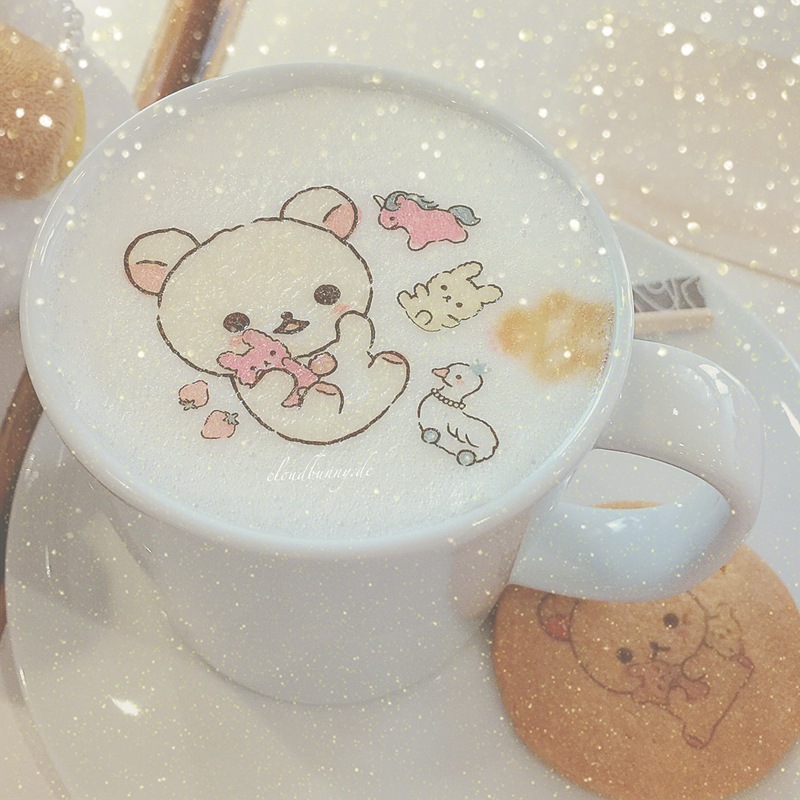 I got a cup of caramel latte, too. 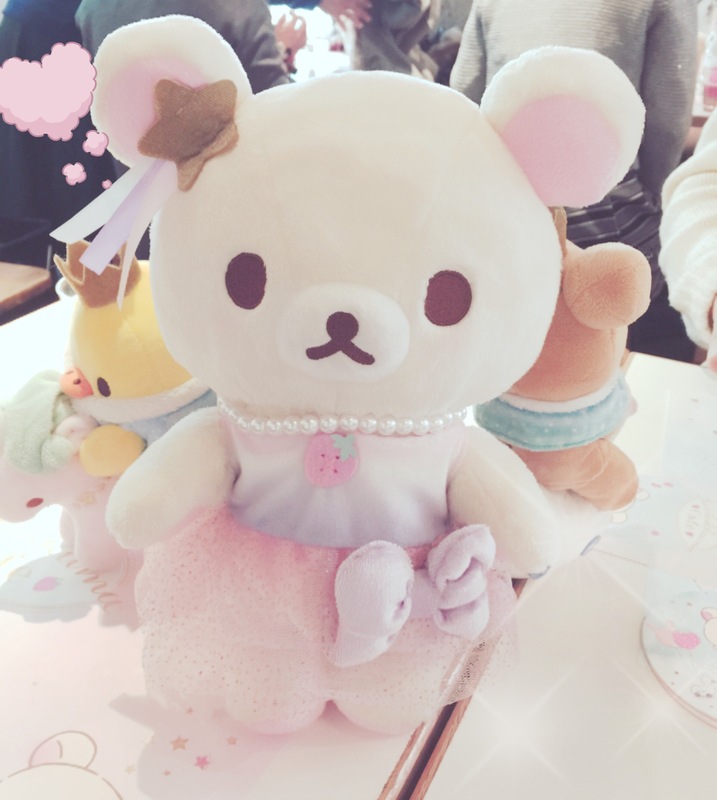 They were just as Korilakkuma very sweet. I have to admit I was about to explode after I almost finished all. I really felt like a monster eating two dishes but for most of the Japanese visitors it was totally fine to just order everything on the menu (and completely emptying the plates!). 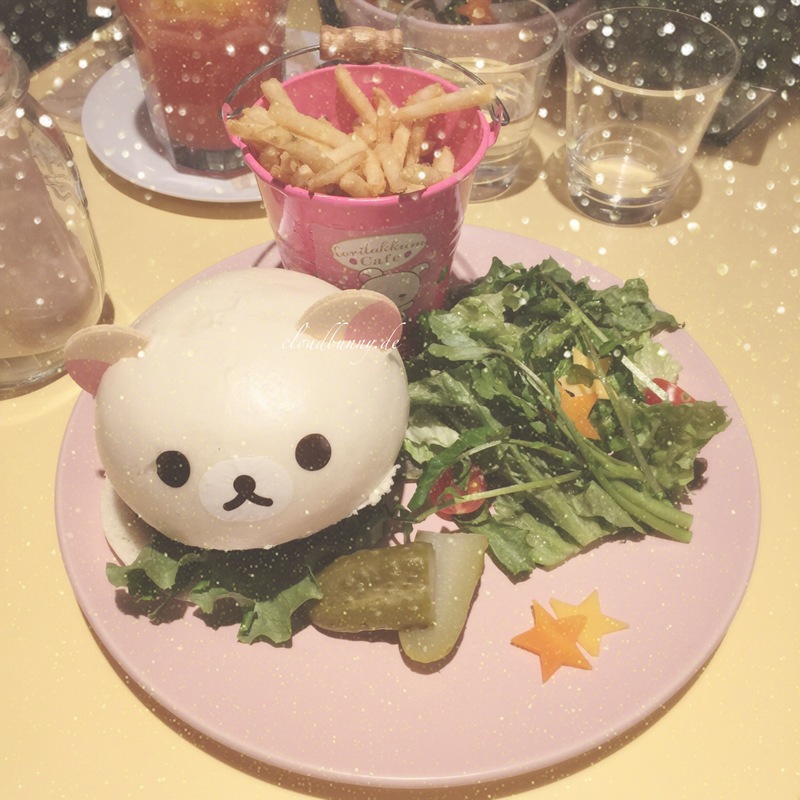 The food was very yummy and really cute to look at. 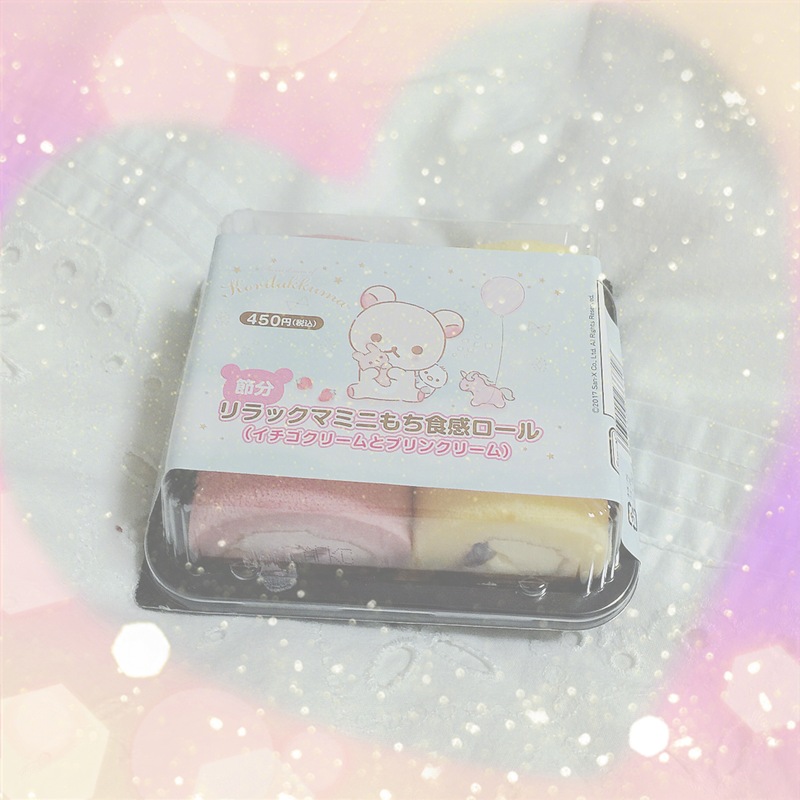 Oh and if you are currently in Japan, don’t miss the cute rilakkuma sweets they sell at Lawson! 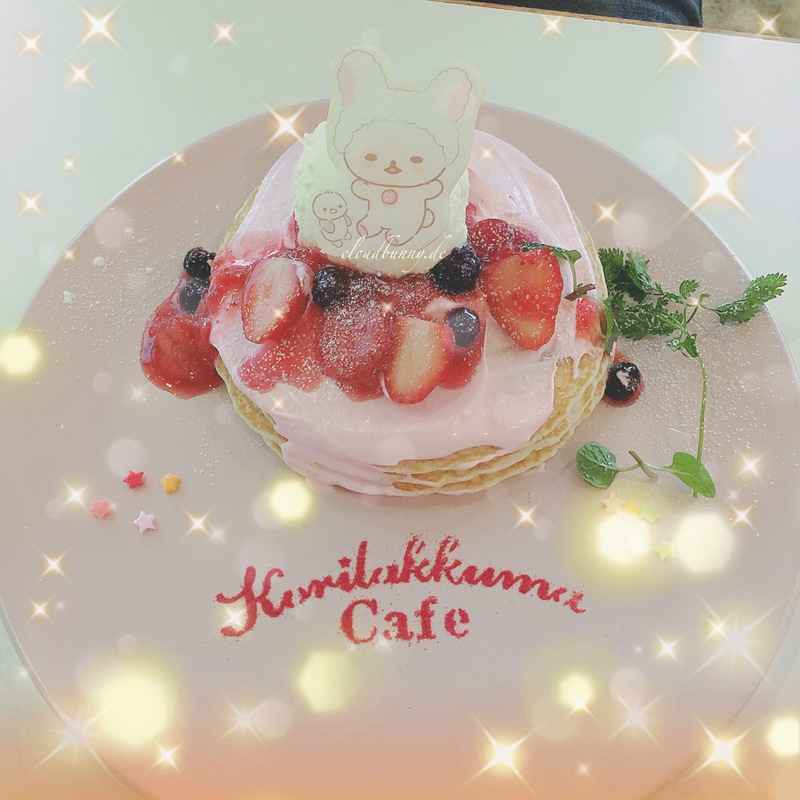 In January I visited Tokyo again for a special reason: the Korilakkuma Café in Harajuku!